Note: This is a personal piece, and not reflective of any stance from the organisers of SL10BCC. As I’ve previously stated on this blog, items which express a personal opinion here do not carry the SL10BCC logo. They do not form announcements, but are my personal take on events, activities, and where to find information I believe to be of value to people attending the celebrations. The time has come. The regions are open. Are you ready to party? Have you staked-out your spot to watch the hoisting of the flags? To help you get the best vantage-point from which to see the flags being hoist at 13:00 SLT on Sunday June 16th, a map has been produced showing exactly where the flag will rise – simply pick a spot close to any one of red Xs ahead of the ceremony. What to See, Where to Go? 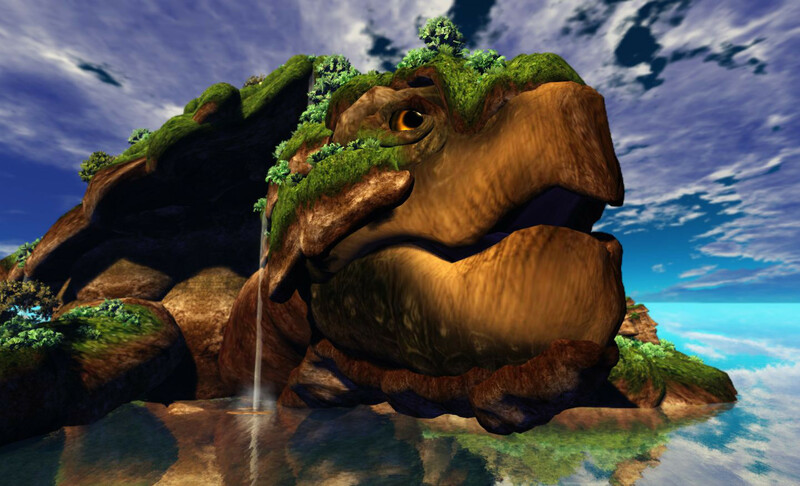 SL10BCC offers twenty regions, many with 36 exhibits apiece in them, plus the Cornfield and Bear Island, and all the various entertainments running 24/7 on the main stages and elsewhere in the regions – and only eight days in which to see it all! When you have limited in-world time, the numbers can be overwhelming and leave you wondering just how you’ll manage to see all the best bits. Well, help is at hand. Crap Mariner, SLB veteran, raconteur and robot-about-SL has put together an informative, if personal, guide to all there is at SL10BCC. Each and every exhibit is located, named, and rated. I perosnally find it an invaluable guide if you want to cut to the quick and use your time to the best advantage. If you are bewildered or befuddled by all there is to see, check-out R. Crap Mariner’s Brutally Honest SL10B Sim Tour. And don’t forget to check-out his Shatoetry exhibit while you’re at it. After all, where else are you ever likely to come across Crap Mariner and William Shatner in the same space, other than in Second Life! 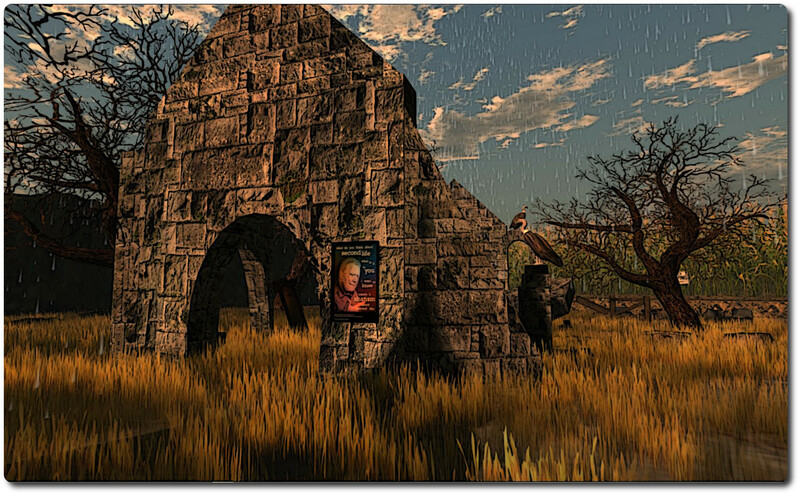 If you want to add some fun to your explorations of SL10BCC but are unsure of where to go, you might consider following in David Abbot’s footsteps as he start out on The Long Walk. The Long Walk will lead you through the streets of the SL10BCC regions on a journey of discovery. 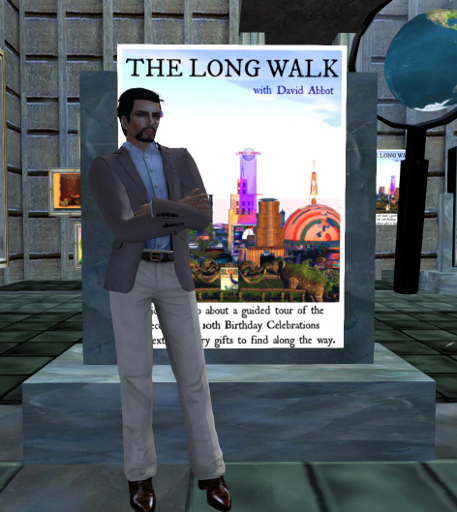 Every day for the Birthday Week, David will be posting an account to the official SL10BCC blog of his explorations of the celebration regions and recounting some of the amazing sights he sees along the way. All you have to do is follow in his footsteps. Along each stage of the journey, if you pick-up on the hints and keep your eyes peeled, you can pick up one or two special gifts. But be warned! These may not always be in the locations he mentions directly, although the clues will be there – even if they take the form of an X marking the spot! He’s already posted his first diary entry in preparation for his explorations, so be such to catch-up with David through the blog and follow in his footsteps daily! 16:00 SLT – The A’stra Team of Toady Nakamura and Flea Bussy will be talking all things – which will doubtless include their beloved and astounding Grendels. As Philip Rosedale once remarked: As goes Grendels, so goes the grid.” Find out why as Toady and Flea sit down with Saffia. Catch up with the complete Auditorium Schedule for the week. Good photo… I’d been hoping to keep a gloomy sunset view, but the cornfield works… and avoids the horrendous tower of fashionista ugly to the northeast. I was torn between a darker sky and that image. Will be back for another play at some point in the proceedings :). So you’re not the only one who wonders who OK’d that bloody eyesore. 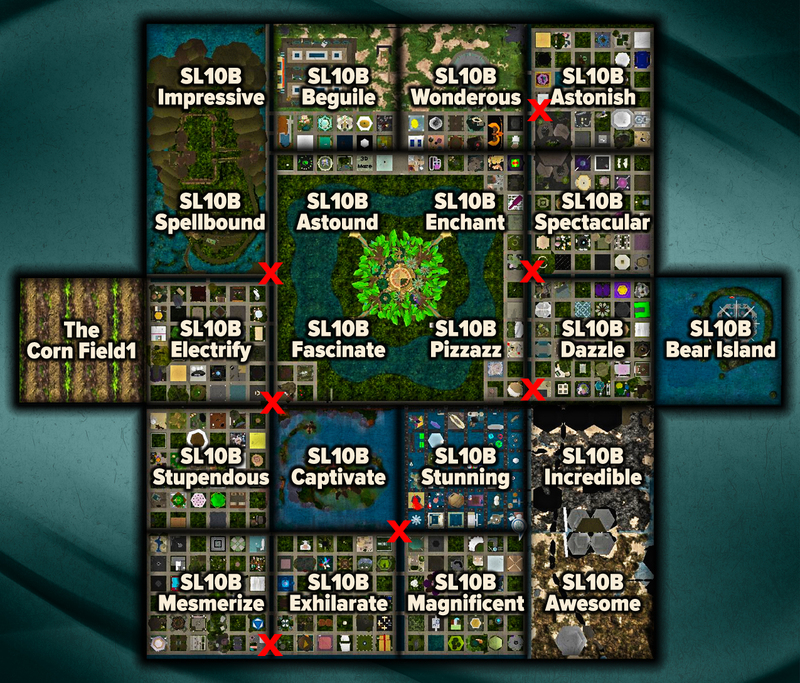 And you can get locations of ALL the parcels, titles, and SLURLs on the community blog here: http://slcommunitycelebration.com/slurls/. I’ve been doing some exploring, and peering at maps, and wondering William Tare Fox! There is that huge thing in the middle of a lake, and I still haven’t figured how to get there without swimming or flying: things like that. The huge thing in the middle of the lake is the cake stage. If you don’t mind getting your fur wet, the water in the lake is warm enough for a relaxing swim ;-).